MVC is a concept that enables to separate business logic from the presentation. One of the biggest advantages is the code re-usability. There are other benefits, such as: designers edit the Views, without worrying that they will screw up database access logic. It is database layer to interact with database and responsible to manage the data; it stores and retrieves entities used by an application and contains the logic implemented by the application. Each entity has its own model. 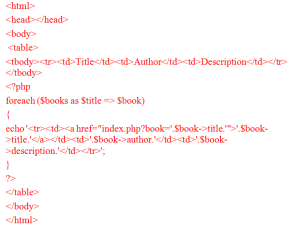 It is presentation layer responsible to display the data provided by the model in a specific format. It is core layer to handle the model and view layers to work together. On request receive from client, controller invoke the model to perform the requested operations like insert, delete, update and get data related to current request and sends to the View. 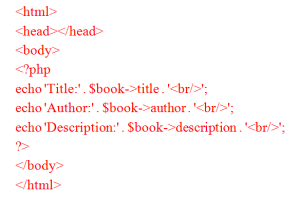 The view receive the data and format it to be presented to the user in HTML format. The controller is the first thing which takes a request, parses it, initializes and invoke the model and takes the model response and sends it to the presentation layer. It’s practically the medium between the Model and the View. 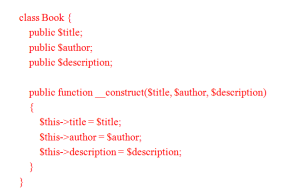 Our Controller class has only one function and the constructor. The constructor instantiates a model class and when a request is done, the controller decides which data is required from the model. Then it calls the model class to retrieve the data. After that it calls the corresponding passing the data coming from the model. Storing, deleting, and updating the application data. Generally it includes the database operations, but implementing the same operations invoking external web services or APIs is not an unusual at all. Encapsulating the application logic. This is the layer that should implement all the logic of the application. The most common mistakes are to implement application logic operations inside the controller or the view (presentation) layer. 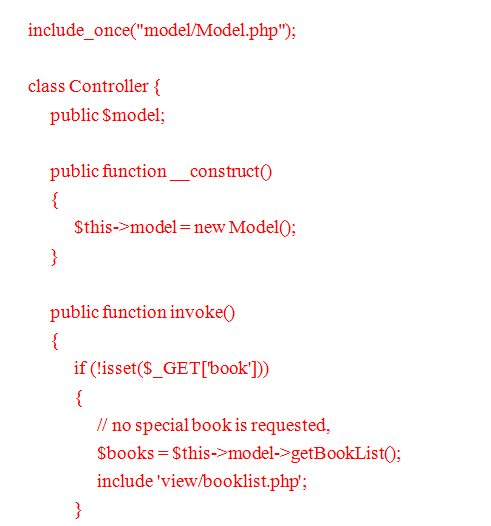 In our example the model is represented by 2 classes: the “Model” class and a “Book” class. The model doesn’t need any other presentation. 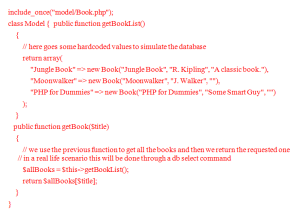 The “Book” class is an entity class. Their solely purpose is to keep data. 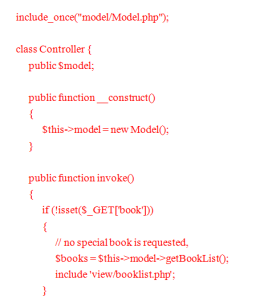 The above example is a simplified implementation in PHP. Most of the PHP web frameworks based on MVC have similar implementations, in a much better shape. However, the possibility of MVC pattern are endless. Abuakar is working as a php developer, having the experience more then half and a year. He is best in OOp based php, Laravel and CodeIgniter.